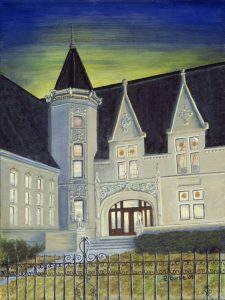 An original and copies of this painting of the Albright Memorial Library done by Austin Burke will be just one of the items up for live auction. Austin Burke will be auctioning off original art to benefit the Albright Memorial Library on Thursday, October 11, 2018. The auction will be held in The Henkelman Room, second floor of the Albright Memorial Library. A reception will be held at 6:00 PM with the auction starting at 7:00 PM. Tickets are $20 and will go on sale September 11, 2018 online and in person at the Albright Memorial Library. Ticket price includes a program book and light refreshments. The event is for adults 21 and over. Austin Burke is a product of the region and of proud, hard-working immigrant ancestors. Burke has worked to record the pride of the populace, their creations and their celebrations through a series of paintings he produced over the past two decades. Now retired after a forty-year career as former president of the Greater Scranton Chamber of Commerce, Burke is making his work available to friends and admirers who have requested it and to the residents, visitors and alumni who share a love for this Northeastern Pennsylvania community. Part of the proceeds will benefit the Albright Memorial Library. Michael Melcher, theatre director for CaPAA, will be the event’s auctioneer. For more information on Austin Burke, visit www.AustinBurkeArt.com or www.Fineartamerica.com. For more information on the Albright Memorial Library, visit www.albright.org or call (570) 348-3000 ext. 5000.